Hong Kong has been a beacon of capitalism since its independence in sovereignty in July of 1997, attracting the interest of international investors worldwide. Despite setbacks during the Asian Financial Crisis and 2008 Global Economic Downturn, the country has become one of the world's leading financial centers known for its low taxes and free trade agreements. 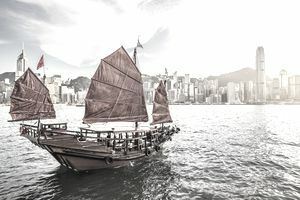 In this article, we will take a closer look at Hong Kong's economy, how investors can gain exposure to the country, and some important risk factors to consider. Hong Kong was once described by Milton Friedman as the world's greatest experiment in laissez-faire capitalism, although there have been a number of regulations introduced since then. Still, the country has ranked the freest countries in the world on the Index of Economic Freedom for every year since 1995, before it was even independent. Hong Kong now hosts the seventh largest stock exchange in the world, the largest initial public offering market in the world, and has one of the greatest concentrations of corporate headquarters in the Asia-Pacific region. Perhaps even more staggering, over 8% of its households own at least one million U.S. dollars in net worth. According to the 2012 Wealth Report by Knight Frank Research and Citi Private Bank, Hong Kong will become the world's second-largest economy measured by gross domestic product (GDP) per capita by 2050 with the metric hitting $116,639 per person. By comparison, the U.S. is projected to be fifth on the list after four Asian economies. The easiest way for U.S. investors to gain exposure to Hong Kong's securities is through exchange-traded funds (ETFs), which provide instant diversification in a security that trades on a U.S. stock exchange. Investors can also consider one of many American Depository Receipts (ADRs) that offer exposure to a single foreign security on a U.S. stock exchange. There are many benefits and risks associated with investing in Hong Kong that investors should carefully consider. While the country certainly represents an attractive investment destination on the surface, there are many factors that could make it a riskier investment during a financial crisis, such as the Asian Financial Crisis in 1997. Leading Global Economy. Hong Kong is the freest country and perhaps the most important financial center in the world. Proximity to Asian Growth. Many of the world's largest economies moving forward will be based in Asia, which puts Hong Kong in a strong geographical position. Geopolitical Risks. Hong Kong's proximity to China puts it at risk of geopolitical issues, particularly as many business leaders originate from the country. Concentration of Risk. Hong Kong's economy is heavily dependent on its financial sector, which puts it at great risk during financial downturns. Hong Kong has been a beacon of capitalism in one of the world's fastest-growing regions, making it a premier destination for international investors. The easiest way to gain exposure to Hong Kong in the U.S. is through ETFs, like the iShares MSCI Hong Kong Index Fund (NYSE: EWH). Investors should take into account the risks associated with Hong Kong before committing capital, including political risks and a lack of diversification.